Your life days are about to brighten up; your baby is on the door. Overwhelming changes are inevitable! Your cat, too, would sniff it out. Your maggot is smarter than might think. Most important: some ‘rules’ that has to do with the cat’s behavior are about to change shape and content! You got better prepare the little companion for this change as soon as possible! These few tips should help you. A visit to the veterinarian before the birth of the baby is quite essential. This check-up will allow you to make sure your cat is healthy, that his vaccines are up to date, and that he has no parasites. Such a visit would be more of more value if you make it an opportunity to reap advice on how to prepare your companion on 4 legs for welcoming his little human brother or sister! Do not wait until the baby at home! Scratches, bites, jumps on furniture, raids on the door... Find a way to end up these troubles before your little kid arrives. Never hesitate to call upon a behaviorist’s help if you feel the slightest inadequacy of tips and information provided by friends, relatives or online forums. If your cat is not yet accustomed to having his claws handled at an early age, it's time to fix it up. That is of vital importance and should not be left to chance! Otherwise, you may endanger your baby's tender skin ! To trim a cat's claws, use a nail clipper, and try to keep your little feline under your arm as you grab the end of his paw between your fingers. Then press down on the base of the claw and on the paw so that the claw comes out. You’ll more likely need someone else's help if kitty is too recalcitrant. If you have relatives or friends who have babies, take the opportunity and invite them to your home, so that your kitty becomes familiar with the smell, noise and behavior of the little human beings. 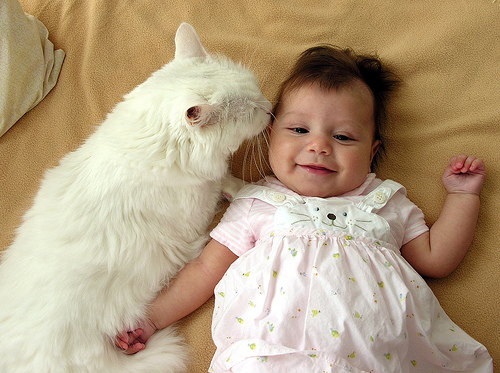 You can also record baby sounds, and have your cat regularly listen to them, for about ten minutes each day. To avoid frightening you kitty, play the tape at a very low volume while he is eating or playing. Each time, you can raise the volume a little until you feel your cat becomes comfortable with babies’ crying and screaming. Why not also coat your hands with baby powder and cream, and invite your cat to sniff them? That’ll help get the little feline at ease with baby’s smell. Remember: try your best not to neglect your companion as you get busy with your baby. Make sure to keep your pet’s schedule intact. The two partners can sometimes exchange roles; while one tends to the baby, the other plays with the cat. It is time to decide if you will need to change where your cat currently rests and sleeps. For instance, the spare room where your cat usually has free access may become the nursery for the baby. Gradually encourage your cat to sleep in other areas and then keep the nursery door closed. Make this and other changes well in advance so your cat does not associate the change with the coming of the baby. You will then have to leave the magic to operate, and witness the beautiful spectacle that can be the birth of a great friendship between an animal and a kid.